WASHINGTON (April 11, 2008) -- Despite reports to the contrary, the body armor being used by Soldiers today in Iraq has been rigorously tested. During testimony before the House Armed Services Committee subcommittee on air and land forces, Lt. Gen. N. Ross Thompson III, military deputy to the acting Assistant Secretary of the Army for Acquisition, Logistics And Technology, told committee members that a misinterpretation of the Federal Acquisition Regulation had led some to believe body armor issued to Soldiers had not been properly tested before it was fielded. 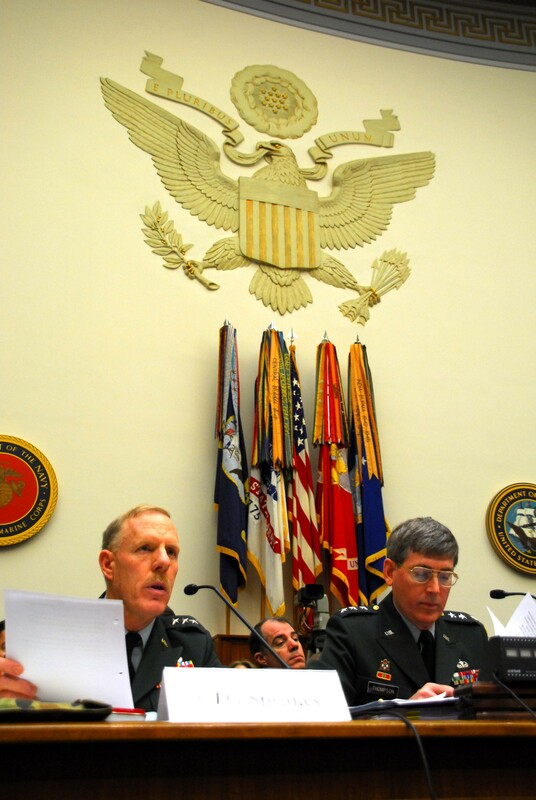 Lt. Gen. Stephen M. Speakes and Lt. Gen. N. Ross Thompson III testified April 10 before the House Armed Services Committee subcommittee on air and land forces. The discussed such issues as equipping the Reserve component, Army transformation and Future Combat Systems. "The Army has tested all of the body armor and all of the body armor that is issued to the Soldiers today has passed the rigorous test and it is the best body armor that is available in the world today; and I can say that without qualification," Thompson said. "Of all high-priority programs, force protection is our number one priority." Both Thompson and Lt. Gen. Stephen M. Speakes, deputy chief Of staff, G-8, met with lawmakers April 10 to discuss Army acquisition programs and strategy. The two discussed such issues as equipping the Reserve component, Army transformation and Future Combat Systems. Lawmakers asked what the Army is doing to ensure Soldiers in the Army National Guard and Army Reserve are equipped at the same level as the active-duty Army. Speakes said the Army has recognized the importance of the reserve components and takes seriously the requirement to equip them. "Those are two key components of our force that are never more important than they are today," he said. "We count on them from the stance of homeland defense and as part of our operational force." The general told congressmen that the Army has developed plans to eliminate "evil" practices of the past, such as the cascading of used but serviceable equipment from the active component into the reserve. "That was a negative practice for a bunch of reasons," he said. "We now send new equipment to whatever unit is in the transformation process or is getting ready to go to war. It treats everybody equally in regard to their access to equipment." In submitted testimony, Speakes said the Army has made "historic strides" in improving the quantity and quality of equipment provided to reserve components. The Army will field more than 518,000 items to the Army National Guard and Army Reserve during a two-year period that began in January. That represents some 46 percent of all Army distributions, he said. "The equipment they are receiving is materially improving the capability of the Army Guard to conduct Homeland Security and Homeland Defense missions," he said. Speakes also said Army transformation to the modular design creates a single standard for all components of the service. "We now have one measuring stick to use for everybody." Completion of that modernization, across the entire Army, is expected by 2013. By 2011, the Army expects to field "Spin Out 1" of Future Combat System technology. That technology includes the Non-Line of Sight Launch System, Urban Unattended Ground Sensors, Tactical Unattended Ground Sensors, and FCS Network Integration Kits for Abrams, Bradley, and Humvee platforms. Those systems, said Thompson, are key to the Army's transformation efforts. "We are a high technology Army and we have a comprehensive strategy to modernize," he said. "Our FCS ... is the foundation of our Army transformation and really the cornerstone of the Army's future modular force."